I don’t really remember when I was first introduced to Will Durant’s Mansions of Philosophy, but I do remember the exhilaration I felt as I turned every page for the first time. By the time I got to page 264, I was fully captivated by this Jesuit educated philosopher. 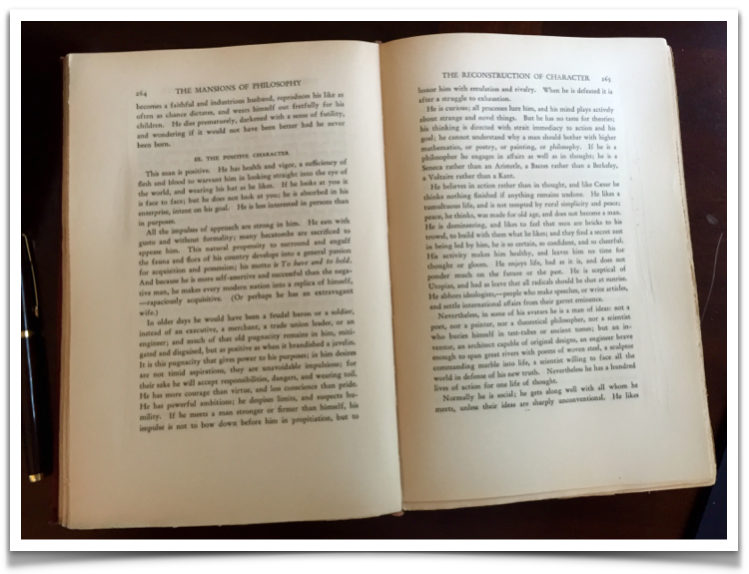 I can unabashedly say that no three pages of anything I have ever read before or since have had the abiding impact on my life that Will Durant’s passage on the Positive Character [pages 264-266] has had. “What he has above all is will.” This still jumps off page 266 like a bolt of lightning every time I turn to it. He ends this remarkable passage with “He dies never doubting that life was a boon, and only sorry that he must leave the game to younger players.” And, for me, life has certainly been a boon. For over 40 years, I still roam the Mansion chapters at random – never once leaving unmoved. I could site a hundred passages or more that have lifted my spirit, challenged my perspective, or honed my character. Although written in 1929, it remains as relevant as ever, while proving time and again that its impact on me is as enduring as it is relentless. Like 50 years of Fr. Sturm, it gives me no respite. It pushes me to reevaluate everything, never pausing to be complacent with the man I am. Yet, like Fr. Sturm, always providing me with the comfort of an appreciation for the gift of life and the man I might yet be. Yes, life is a dance, not a dress rehearsal; and it’s up to us to make the most of it. Will Durant’s timeless perspective comes from his belief that “Most of us spend too much time on the last twenty-four hours and too little on the last six thousand years.” Fortunately, this is balanced by his constant urging to live life in the present with a confident zeal for all that life is meant to be. I’m in it every minute. 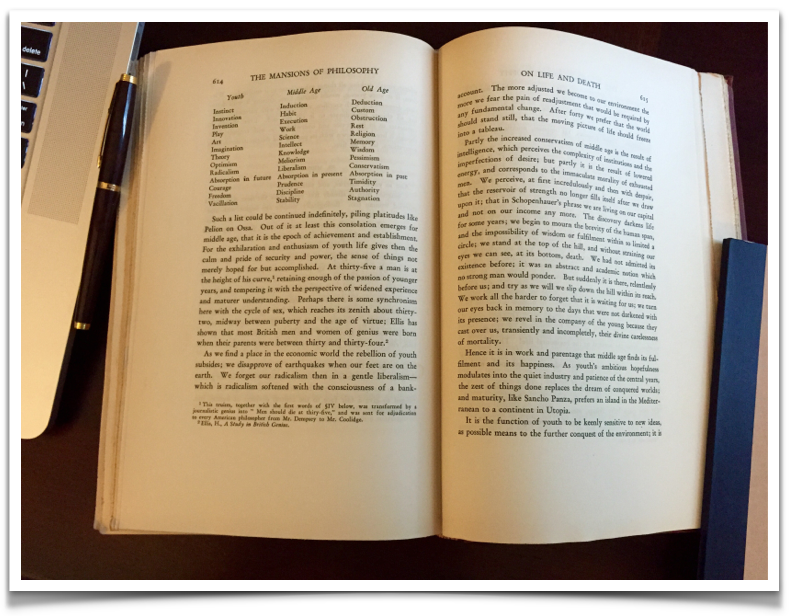 Pick up a copy of the revised edition, The Pleasures of Philosophy, and I am certain that you will not be the lesser for it. It just might become one of your favorites. The Third Factor: Genetics. Environment. Will. Will Durant finds his way into the Advantage Co handbook directly and indirectly on every page. His influence on my business philosophy is as conspicuous as it is on my aesthetics. 57. The Mansions of Philosophy. 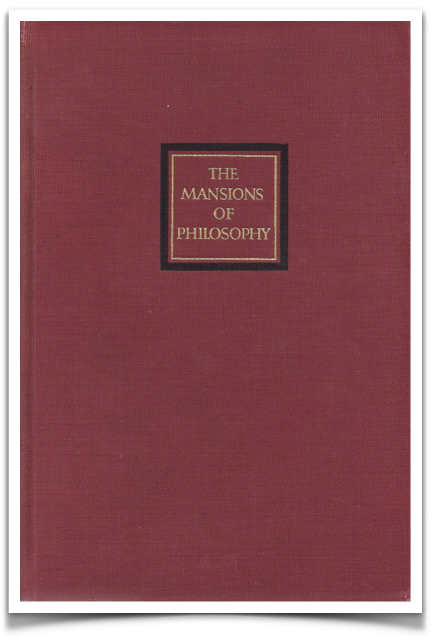 In 1929, Will Durant wrote The Mansions of Philosophy, a story of human life and destiny, or, as the subtitle promises, an attempt at a consistent philosophy of life. It has been a chisel on my life. One of the most revealing chapters concerns itself with character. Character, in Durant’s view, is a sum of inherent dispositions and desires; it is a mosaic of instincts colored and rearranged by environment, occupation, and experience. Below he formulates the extremes: the negative and the positive character. 58. Here is his negative character: …If he meets a man he observes him unobserved, looking at everything but the eyes, and measuring the other’s power and intentions. If danger comes, he trembles with surprise and fear; he does not feel active anger, but is consumed with a fretful resentment; his violence is the mask of one who knows that he will submit. He shrinks from responsibility and trial. He believes that the world would entrust him with leadership if it had intelligence. If he succeeds in anything, he credits himself; if he fails, he is “not guilty”; it is the environment [i.e., other people] that is at fault, or the government, or the arrangement of the stars. He is a pessimist about the world, and an optimist about himself. Rest and inaction, being his essence, causes him to shun the sharper realities and tasks of life, and shrinks into a world of reverie, in which he wins many victories. These being his impulses, he is weak above all because his impulses are not coordinated by some purpose that dominates and unifies his life. He is restless though always seeking rest; he passes discontent from project to project and from place to place; he is a ship that never makes a port, while all its cargo rots. He is incapable of regularity or industry; and though he seems at times nervously busy, he finds himself unable to persist in a definite purpose. He is intense in intention and lax in application; he is given to bursts of passion that simulate strength, but they end in quick exhaustion and accepted chaos. He has a thousand wishes, but no will. 59. Here is the positive character: …If he looks at you it is face to face; but he does not look at you; he is absorbed in his enterprise, intent on his goal. His motto is ‘to have and to hold.’ It is his pugnacity that gives power to his purposes; in him desires are not timid aspirations, they are unavoidable impulsions; for their sake he will accept responsibilities, dangers, and wearing toil. He has more courage than virtue, and less conscience than pride. He has powerful ambitions; he despises limits, and suspects humility. If he meets a man stronger than himself, his impulse is not to bow down before him, but to honor him with emulation and rivalry. When he is defeated, it is after a struggle to exhaustion. He is curious; all processes lure him, and his mind plays actively about. He believes in action rather than thought, and like Caesar he thinks nothing finished if anything remains undone. He is domineering, and likes to think that men are bricks to his trowel, to build with them what he likes; and they find a secret zest in being led by him, he is so certain, so confident, and so cheerful. He has a hundred lives of action for one life of thought. What he has above all is will. A unity of aim, an order and perspective and hierarchy of purposes, molded in his character by some persisting and dominating design. He dies never doubting that life was a boon, and only sorry that he must leave the game to younger players. Tony – I found this to be especially meaningful to me at this point in my life. I feel that until recently I have lived as the negative character. My life was consumed with periods of outstanding achievement and long hours of hard work. At the same time it was also consumed by equally destructive behavior such as food addiction and a few others. I believe the most fertile breeding ground for self destructive behavior and addictions is in the negative character community. The sum total so far has been not having much to show for a lifetime of two steps forward and two steps back. Life was like one big game of chutes and ladders. It all fell apart for me at the end of 2014. It was time to either die or start living as the positive character. I got some great therapy that helped me to properly value myself and no longer be willing to participate in my own demise. I now have great hope for myself, my future, and for the loved ones in my life. No matter how deep I was in the negative character I was always aware of the positive character. I admired the accomplishments and attitudes of the positive character and I always felt I was destined to one day personally evolved into one. I do at times struggle with the regret of taking so long to get here and being fearful that it is too late but I realize that is the negative character rearing it’s ugly head. I am now excited to build something outstanding with the the rest of my life – something greater than what I would have done had I never fallen. I have so many goals including health and fitness, golf, career and finances, and marriage and family. I will achieve fitness, meeting the women of my dreams, and building financial independence or die trying. I can accept that attitude. They say the Masters doesn’t start until the back nine on Sunday. I feel like I made a lot of birdies and a lot of bogeys on the front nine that left me well behind the leaders but I fully intend to take it low on the back nine and claim ultimate victory. Plenty of football games are won after half time because the coaches make effective adjustments. I will need help and guidance but I will do the work and I am committed to displaying my will to get there.